Publisher: D.C. Thomson & Co., Ltd. Description: "Dear girls and boys. 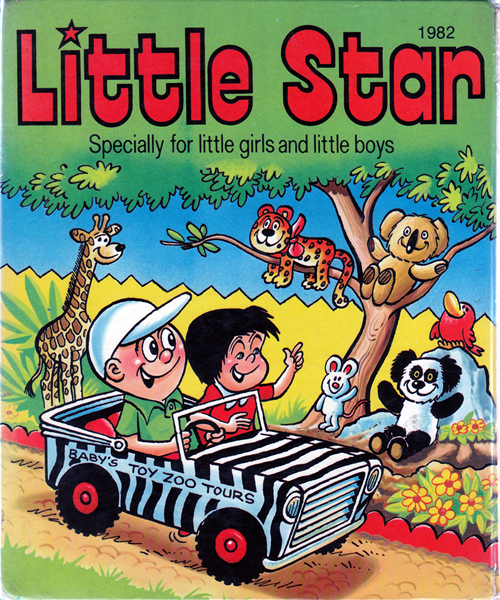 Here is another super Little Star Book that's specially for you. Inside, there are tip-top stories about Teddy's winter treat, King Bumble's Birthday and Billy Bike's good deed. You're sure to laugh at the comic adventures of Wuff, Goody Gumdrops — and Baby Crockett, too, of course! There are lots of puzzles and an exciting game to play called Jungle Journey." Delightfully illustrated throughout in bold Technicolor! Glazed pictorial boards are in very good overall condition. Spine and corners are bumped and worn. One or two pages have closed tears at the bottom, and another has been 'framed' in green felt-tip (contents are largely unaffected). Several of the puzzles have been solved in black ballpoint, whilst others have some small marks in green felt-tip. Pages are in varying condition, with stains and grubby marks on some, and light creasing on others. Overall condition, however, is good, and all pages and illustrations retain their vibrancy. Unclipped (original price of £1.40 present). Measures 24 cm × 20 cm (9.5″ × 8″). Oversize 8vo. Unpaginated.